We had the boys wait until Christmas to open them and actually put them together. 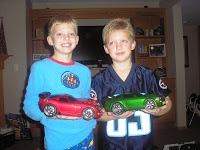 They were very excited about their new cars. We did not get the remote control option so they could drive them around themselves. I would also suggest that you get a sound card different from the standard as the others have more options for sounds. But, the cars are WAY COOL! I think my husband was secretly wishing that he had one of his own. So, if you haven’t checked out their website it is http://www.blogger.com/www.ridemakerz.com and for a few more days you can still use a coupon code to save $10 off a $30 purchase. Enter in 93474 in the checkout! This offer expires January 4, 2009.